H2 – Honor student access to content material. Teacher candidates use multiple instructional strategies, including the principles of second language acquisition, to address student academic language ability levels and cultural and linguistic backgrounds. Many regard mathematics as a second language. 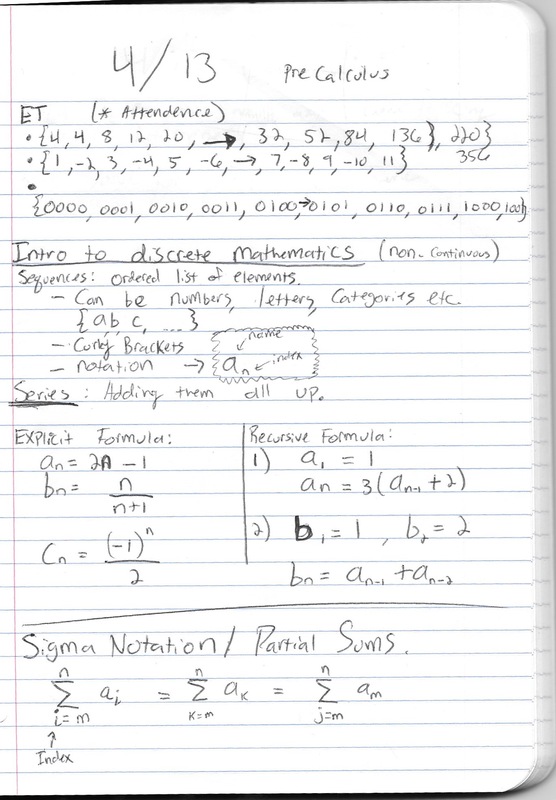 Mathematica notation and use of mathematical vocabulary are essential to learning this topic. At the school where I work, all students are fluent english language speakers, it is unusual to encounter a language barrier in communication. Most of the language acquisition problems are through the understanding of mathematical language. To address this HOPE standard, math teachers must make the mathematical language more accessible by planning in vocabulary acquisition and teaching concepts and then naming the concepts. The evidence I am presenting is two photocopies of some lesson plans where I am introducing two new topics. The first I am introducing students to sequences and series. 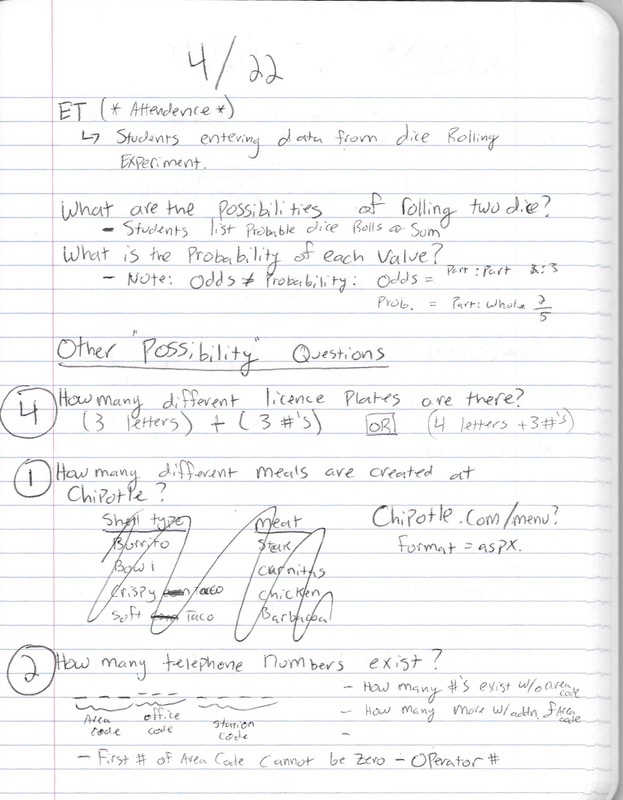 In this lesson, students start with the Entry Task (ET) and are asked to complete “the list of numbers”. Since these are the teacher’s notes, the ideas are just brief notes. After the entry task, the plan is to formally put a name to “a list of numbers” which we will call a sequence. Similarly, as the lesson continues, I plan on clearly indicating and showing students the notation and the vocabulary for the notation about how to write a sequence. When I introduce combinations and permutations on the second lesson plan, I first mention “what are the possibilities of rolling two dice?” This removes technical language, the words “combination” and “permutation” and “the basic multiplication principle” are not even mentioned until the next day in class when students have acquired the conceptual understanding. By removing the barrier of technical language students feel more comfortable with the content. The teacher will avoid the use of confusing language, but if a student uses improper language (such as the note about the difference between probability and odds in the lesson plan), the teacher will address the students misuse of language and avoid confusion of the vocabulary in the future. The HOPE standard is met because the teacher is planning for proper language acquisition and preparing students to understand content and then later naming that content when students struggle for a word to name the idea. Over the course of my teaching internship, I have build knowledge and understanding of how to introduce new ideas to students without complicating the matter. From creating lessons that revolve around language acquisition and notation, I have learned that while I may have a deeper, technical understanding of mathematics, many students do not, and become intimidated by advanced language. By using lower level language, many of my challenged students become engaged. Since many students are apprehensive about mathematics, this technique for introducing new ideas is helpful for students who are overwhelmed by math language and concepts. Providing instruction in an order that is helpful not to overwhelm students is important, especially in mathematics where there is a risk for pushing students away from the topic. To improve my understanding of this program standard, I will need to interact and prepare planning for more students who have different language needs, especially english language learners or those who lack significant mathematical skills. Since this HOPE standard is similar to Differentiation, I hope to address language acquisition, use of language and assisting english language learners as an improvement to my practices in differentiation.